Why do my most profound moments of faith vanish so quickly? What would your life be like if you could harness the rush of faith that appears in the most desperate moments? What if you could live your entire life with the kind of split-second, imminent-disaster faith that crying out to God brings? What if you could live a life of Ridiculous Faith? True faith is vital to a vibrant Christian life. Without it, it is impossible to please God. But are your moments of deepest, most essential faith doomed to dissipate as quickly as they materialize, leaving you powerless and ineffectual? Absolutely not. The truth is, you are not doomed to a lifetime of flickering faith. 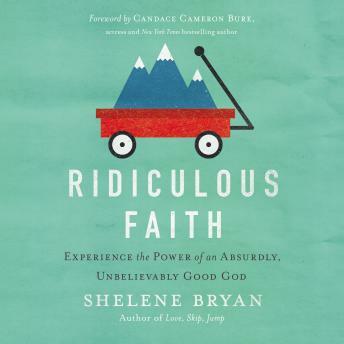 Join Shelene Bryan on a journey to uncover the ark-building, sea-parting, lion-taming, ridiculous faith that will leave you in awe of the Creator and all He has prepared for you. Are you ready to live an absurdly, unbelievably good life—a ridiculous life of ridiculous faith?